Okay, it’s not quite summer yet — the random 50-degree weather here in New England this week proved that pretty conclusively (insert shaking of fist at the sky). But be honest with me. You’re THINKING about summer, right? The outdoor fun, the picnics, the barbecues? The thing is, every summer, people are just dying to get together with friends, grill some stuff, share some salads, and rejoice in beautiful weather and good food. And the thing is that every summer, most of the people I know — and since this is my blog, these people are therefore a representative sample of the ENTIRE WORLD in my skewed little version of the scientific process — get kind of bored with the same old recipes after just one or two cookouts. Now, there are classics like your Aunt Ida’s potato salad, which I understand are the Holy Grail of all barbecue fare and are therefore immutable. I humbly bow to Aunt Ida’s superior spud skills. But there are other classics that, even though we can’t quite bear to give them up, could definitely use a facelift after the first nice weekend of the summer grilling season. Let’s face it — unless the coleslaw is the big family recipe in your house, how many times can you eat the stuff without finding that you’re scraping half your portion into the trash because it got left behind while you filled up on the burgers? So I hereby declare tonight pre-barbecue night on RRG. I’m serving up two recipes for summer staples: Barbecue sauce and that damnable coleslaw. Now, I know barbecue sauce can be easily bought in a convenient bottle. I also know that most bottles contain stuff many of us don’t really want to think about, so we either “forget” to scan the ingredients or bury our guilt in the pile of napkins and rib bones. I’ve seen many, many requests on various blogs and Facebook pages for a barbecue sauce recipe that’s easy and doesn’t call for a pound and a half of ketchup to start with; so I figured it couldn’t be hard to create one myself. Turns out, it wasn’t that hard. I know barbecue sauce is a very personal thing, and it’s likely that many people will want to take this recipe only as a starting point from which they can add their own flair. That’s fine. I highly recommend tweaking ANY recipe of mine to suit your individual tastes, and I especially recommend that you tweak this sauce as you see fit, because I don’t want to be the cause of any spoiled barbecue experiences. But J., the boys, and I found this sauce to be simple and tasty on pulled pork, so I think it’s worth sharing with you all. As to the coleslaw, I must confess that I cannot. Stand. Mayo. Can’t abide the stuff. Never was a fan, never will be a fan, and as a result, most coleslaw is just beyond me. I’m also always intrigued by the annual realization that we appear, as a culture, to have created a whole series of mayonnaise-heavy recipes just in time to set them all out under the blazing sun to serve to our dearest friends. Really, people? Why not just add Sal Monella to the guest list and be done with it? So this coleslaw recipe contains NO MAYONNAISE. None. No dairy of any kind, in fact — so it’s a perfectly safe potluck/picnic/barbecue/buffet offering. It’s also quick, simple, and cheap, which as far as I can tell are the other requirements of a coleslaw recipe. This is the side dish, after all, not the star of the show, But I should point out that THIS coleslaw is not likely to find its destiny in the trash can under all the corn cobs at the end of the night. 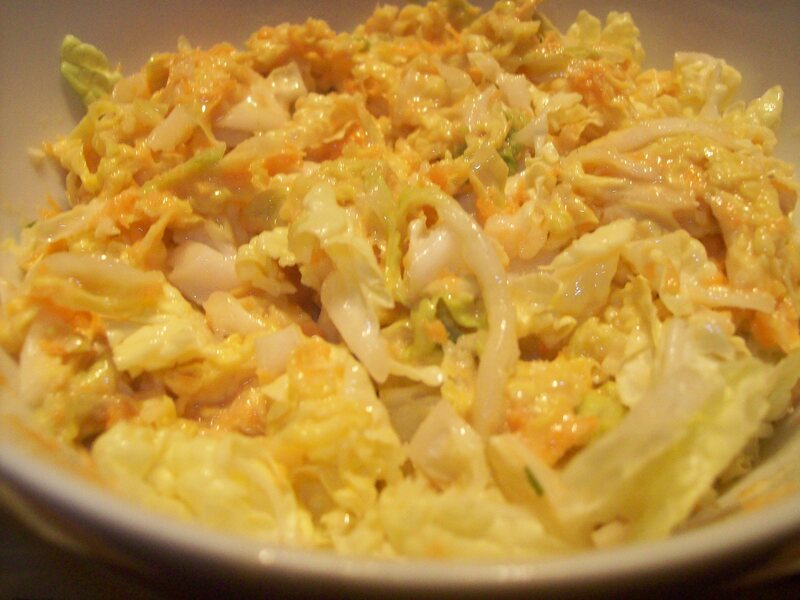 Combine the cabbage and carrots in a large bowl. Finely grate the onion over a small bowl to capture the juices as the base of the dressing. Again, I used my microplane for this task. Whisk in the tahini, lemon juice, honey, and olive oil. Season with salt and pepper. Pour the dressing over the vegetables and toss to evenly coat. Taste and adjust seasonings if needed. If desired, you could serve this with some chopped toasted peanuts or cashews over the top. This entry was posted in Cooking, Feeding kids and tagged cooking, family, feeding kids, food, holidays, meal planning, party, potluck, recipes. Bookmark the permalink. I have nominated you for the Sunshine Blogger’s Award! Thank you so much for bringing sunshine into my life! And for providing me with meal plan inspiration! Oh, you are so sweet! I will follow through on this this week, I swear. I was out of the country and I’m just catching up! Thank you!!!! As far as barbecue goes, there are so many different regional barbecue sauces…! Oy. So true! I’m certainly no barbecue expert — I figure, if I can just approximate what most people are thinking of when they want to avoid the grocery store bottle, I’m doing okay! So you’re a fan of creamy coleslaw? I prefer mine sweet and sour: Cabbage, carrots, scallions and a dressing of just vinegar, brown sugar, and a little salt. Sounds great, Uly! I’m actually usually more of a vinaigrette/sweet and sour girl myself, but this time I thought it would be nice to try to change up the classic creamy style one. I really liked it, too — the vague nuttiness of the tahini was a good touch. Plus, J.’s a creamy slaw fan, so I figured I’d throw him a bone! I hope your kids are doing fine with adding gluten and casein back into their diets. When I learned this from my health inspector I was sputtering…. I still struggle to wrap my mind around it, but there are the facts according to those who are suppose to know. I do wonder what they put in that mayo though…..
Rachael, I just can’t even fathom that comment. 🙂 No, seriously, that’s disgusting. If you make mayonnaise yourself, then you realize pretty quickly it is NOT the kind of thing you want in an unstable food safety environment; so you’re absolutely correct in wondering what the heck they’re putting in that mayo…! Ick! My husband is always BEGGING for tahini coleslaw or any tahini dressing for salads! Have I ever shared my mayo-free potato salad recipe with you? Let me know if you want it. You have not shared, but feel free! My mother-in-law makes a really nice mayo-free German potato salad, which I like very much, but I’m ALWAYS up for new salad recipes.